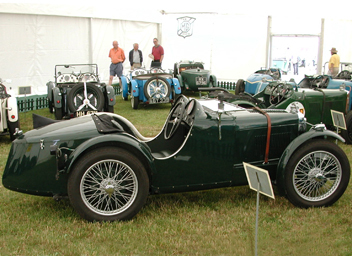 The 'C' type or 'Montlhéry' Midget was introduced in 1931, as a racing version of the 'M' type but owed more to EX127, the 'Magic Midget' experimental car built for record breaking after the success of EX120. 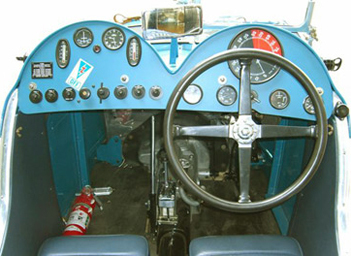 Only 44 were built on the lower chassis whose design is said to have been influenced by examining a racing car built by the French firm Rally. A lot of development took place with the 'C' type and the 'F' type chassis is effectively a longer version of it and even the gearbox was a variant of the ENV one used in that car. 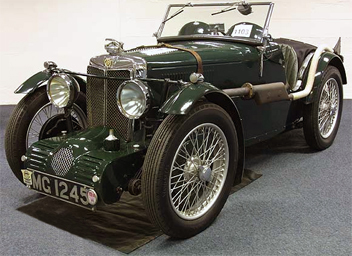 12" brakes were developed for the 'C' type, and in 1932 the 'F' type also gained these in the 'F2' and 'F3' versions. No doubt coverage of the racing successes of the diminutive 'C' type influenced prospective buyers of the 'F' type Magna.